The khapra beetle, Trogoderma granarium Everts, is one of the world's most feared stored-product pests. In fact, it has been described as one of the 100 worst invasive species worldwide (Lowe et al. 2000). Its discovery in California in 1953 led to a massive control and eradication effort which extended until 1966 and cost the government $15 million (Kerr 1981). Established infestations are difficult to control because of the beetle's ability to live without food for long periods of time and to survive on foods of low moisture content. These beetles tend to crawl into tiny cracks and crevices and remain there for long periods, making them relatively tolerant to many surface insecticides and fumigants. Therefore, it is important to prevent the khapra beetle's introduction into uninfested areas (Lindgren et al. 1955). Figure 1. Adult khapra beetle, Trogoderma granarium Everts. Photograph by S. Weingarten, University of Florida. Currently, all infestations discovered in the U.S. have been eradicated. Any possible adults or larvae of this species discovered in the U.S. should be immediately reported to your state regulatory service (Buss and Fasulo 2006). 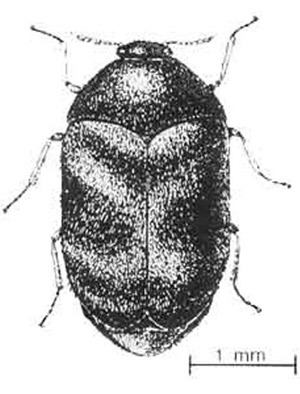 Accurate distribution records for the khapra beetle are difficult to obtain, because admission of its presence in a country may result in trade restrictions being imposed (Banks 1977). Its endemic zone extends from Burma to western Africa and is limited by the 35° parallel to the north and the equator to the south. It has been introduced by commerce into some areas of similar climatic conditions (Anonymous 1981). Lindgren et al. (1955) stated that, except for South America, the khapra beetle is now found in all continents where grain and grain products are stored. However, Szito (2006) reported that this species is not found in Australia (intercepted only) or New Zealand (formerly present, but eradicated). The khapra beetle was first discovered in the U.S. in California in 1953. However, it was later determined to have been introduced as early as 1946 in a warehouse in Fresno, California (Beal 1956), and possibly to have been in the San Joaquin Valley since 1939 (Anonymous 1962). Before its discovery in 1953, it had spread to parts of Arizona, New Mexico, Texas, and Baja California, Mexico. After eradication attempts in these areas the khapra beetle was found in a New Jersey warehouse in 1968 and again in 1980 in isolated infestations from 1980 to 1983 in California, Maryland, Michigan, New Jersey, New York, Pennsylvania and Texas (Anonymous 2006). The 1980-1983 infestations were spread by shipment of infested commodities to warehouses in California, Pennsylvania, and Texas. Eradication efforts in these infested states were started immediately (Kerr 1981). 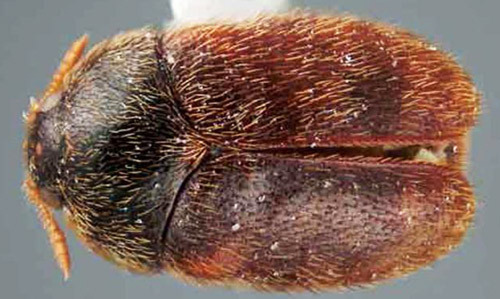 Although not established in Florida, the khapra beetle is sometimes intercepted at ports of entry here and in other states. USDA-APHIS estimates that 67% of the continental US would have a suitable climate for Trogoderma granarium (French Venette 2005). Adults: The adults are oblong-oval beetles, approximately 1.6 to 3.0 mm long and 0.9 to 1.7 mm wide. Males are brown to black with indistinct reddish brown markings on their elytra. Females are slightly larger than males and lighter in color. The head is small and deflexed with short 11-segmented antennae. The antennae have a club of three to five segments, which fit into a groove in the side of the pronotum. The adults are covered with hairs (Buss and Fasulo 2006). Figure 2. Adult khapra beetle, Trogoderma granarium Everts. Figure 3. Adult, larva, and larval skins of the khapra beetle, Trogoderma granarium Everts, and the damage caused by the larvae. Photograph by Anne-Sophie Roy, European and Mediterranean Plant Protection Organization; www.invasive.org. Eggs: The eggs are milky white, turning pale yellowish with age, cylindrical, 0.7 by 0.25 mm, with one end rounded, the other pointed and bearing spine-like projections. Larvae: The larvae at hatching are approximately 1.6 to 1.8 mm long, more than half of this length consisting of a tail made up of hairs on the last abdominal segment. Larvae are uniformly yellowish white, except head and body hairs are brown. As the larvae increase in size, their body color changes to a golden or reddish brown, more body hairs develop, and the tail becomes proportionally shorter. Mature larvae are approximately 6 mm long and 1.5 mm wide. Figure 4. Late instar larva - tail to right. Drawing by Division of Plant Industry. Larvae bear characteristic body hairs: (1) simple hairs in which the shaft bears many small, stiff, upwardly directed processes, and (2) barbed hairs with a constricted shaft in which the apex is a barbed head as long as the preceding 4-segmented-like constrictions (Hadaway 1955, Anonymous 1981). Adult khapra beetles have wings, but apparently do not fly and feed very little. Mated females live from four to seven days, unmated females from 20 to 30 days, and males from seven to 12 days. Mating occurs about five days after emergence, and egg laying begins almost immediately at 40°C. Egg laying may begin at one to three days at cooler temperatures, but no eggs are produced at 20°C. Eggs hatch in three to 14 days after the female lays an average of 50 to 90 eggs that are loosely scattered in the host material. Complete development from egg to adult can take 26 to 220 days, depending upon temperature. Optimum temperature for development is 35°C. If the temperature falls below 25°C for a period of time or if larvae are very crowded, they may enter diapause. They can survive temperatures below -8°C. In diapause, the larvae can molt but are inactive and may remain in this condition for many years (Anonymous 1981). Development can occur at a relative humidity as low as 2%. High relative humidity may be the limiting factor in the survival of introduced khapra beetles (Howe and Lindgren 1957). Larvae feed on a wide variety of stored products and dried foods. They prefer whole grain and cereal products such as wheat, barley, and rice, but larvae have been recorded on the following: oats, rye, corn, dried blood, dried milk, fishmeal, ground nuts, flour, bran, malt, flax seed, alfalfa seed, tomato seed, pinto beans, blackeyed cowpeas, sorghum seed, grain straw, alfalfa hay, noodles, cottonseed meal, dried fruits, lima beans, coconuts, garbanzos, lentils, powdered yeast, and many others (Lindgren and Vincent 1959, Lindgren et al. 1955). Trogoderma granarium is a serious pest of stored products under hot dry conditions. 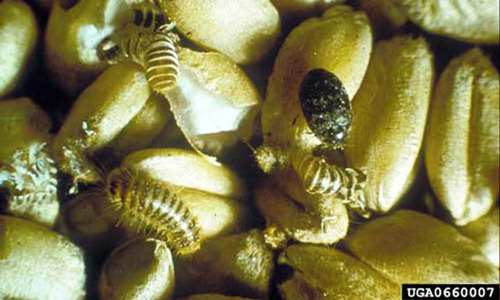 Reproduction may be so rapid that larvae are found in large numbers in the surface layers of binned grain. Its discovery in a non-infested area usually leads to an immediate quarantine of suspected goods and an expensive eradication and control effort. This beetle has never been observed to fly; therefore, its spread is probably dependent on movement of infested goods or in containers where it may be transported while in diapause. The obvious signs of a khapra beetle infestation are the larvae and cast skins. However, the larvae look very similar to those of other relatively unimportant Trogoderma species, as well as some carpet beetles. Larvae and adults are best identified by microscopic examination. USDA-APHIS inspects cargo ships and cargo from khapra beetle infested areas and warehouses containing such cargo. Detection methods include examination of cracks and crevices and inspecting behind paneling on walls and under timbers, tanks, shelves, etc. Larvae are most likely to be seen just before dusk, since they tend to be more active at that time (Anonymous 1981). Some fumigants give control at high dosages, even though this beetle is more resistant to fumigants than most stored product pests. High concentrations of fumigant must be maintained over the fumigation period to allow penetration into all cracks and crevices. In an eradication program, both fumigants and surface sprays are used in combination with preventive measures, e.g., good sanitation practices and exclusion. Anonymous. 1962. Stored grain pests. USDA Farmers' Bulletin. No. 1260, pp. 32-33. Anonymous. 1981. Data sheets on quarantine organisms. Trogoderma granarium Everts. European and Mediterranean Plant Protection Organization Bulletin 11 (1) Set 4, List A2, pp. 1-6. Anonymous. (2006). The khapra beetle (Trogoderma granarium Everts, 1898) (Coleoptera: Dermestidae). California Plant Pest Diagnostic Center. (no longer available online). Bailey SW. (1958). The position of khapra beetle in Australia. FAO Plant Protection Bulletin 6: 72-73. Beal RS, Jr. 1956. Synopsis of the economic species of Trogoderma occurring in the United States with description of a new species (Coleoptera: Dermestidae). Annals of the Entomological Society of America 49: 559-566. Hadaway AB. 1955. The biology of the dermestid beetles, Trogoderma granarium Everts and Trogoderma versicolor (Creutz.). Bulletin of Entomological Research. 46: 781-796. Herrmann A. Trogoderma granarium EVERTS, 1898. Dermestidae (Coleoptera) of the world. Howe RW, Lindgren DL. 1957. How much can the khapra beetle spread in the USA? Journal of Economic Entomology 50: 374-375. Kerr JA. 1984. Khapra beetle returns. Pest Control 49 (12): 24-25. Lindgren DL, Vincent LE. 1959. Biology and control of Tragoderma granarium Everts. Journal of Economic Entomology 52: 312-319. Lowe S, Browne M, Boudjelas S, DePoorter M. (2000). 100 of the world's worst invasive alien species: A selection from the Global Invasive Species Database. Invasive Species Specialist Group, World Conservation Union (IUCN). Szito A. (2006). Trogoderma granarium (insect). Global Invasive Species Database. Author: D.L. Harris, Florida Department of Agriculture and Consumer Services, Division of Plant Industry. Originally published as DPI Entomology Circular 262. Updated for this publication. Publication Date: May 2006. Latest revision: April 2018.